As the recognized authority on buying cars for over 17 years, we are often sought out by the press for commentary on articles, live network appearances and call in radio talk shows. Below are just a few of the news media companies who have written about us, and if available, direct links to the original stories. If you are writing an article for a news site and need our commentary, we understand you are under tight deadlines. Please use our Press Contact Email Form for fastest results. We will get back to you in a very timely manner. CBS Greensboro, NC Affiliate WFMY Channel 2 Airs CarBuyingTips.com story on fake Vehicle History Report Sites - We helped CBS Greensboro, NC Affiliate - Local 2 News (WFMY) station verify that fake Vehicle History Reports sites are attempting to steal your credit card numbers and other personal information. ABC Miami Channel 10 Airs CarBuyingTips.com story on Craigslist Fraud - We helped our Miami ABC affiliate - Local 10 News (WPLG) station team get the word out to consumers about this fresh new internet scam that we uncovered. The Best Time to Buy - Internet talk radio piece discussing "When is the best time to buy a vehicle?" Online scheme snares Sarasota physician - A Herald Tribune story about a common internet car buying scam. How Not to Buy a Car - A WSJ Story about common new car buying mistakes that are easily avoidable. This article is only available to WSJ paid subscribers. Used-car peace of mind -- cheap - Story about checking the vehicle history of used cars, and pitfalls to avoid. 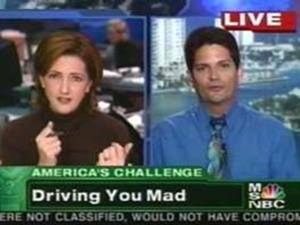 Worst Dealer Scams - Jeff was interviewed for this story about car dealer scams. Detroit's Losses Mean Higher Car Payments for Leases - Jeff commented on this story about leasing complications for the big three as off lease vehicles have much lower values than dealers anticipated. 4 keys to buying a car online - Jeff gave advice on avoiding scams while buy vehicles online. Car Makers Roll Out Deals on Hot Models - Jeff gave advice for getting financed on new cars. Car scammers target Web buyers, sellers - Jeff was interviewed for this story about internet scammers targeting sites from eBay to Autotrader, nailing victims all over the world. There was also an audio interview that appeared on CNN Radio. Car buyers' top 10 mistakes - Jeff was interviewed for this story written by BankRate that details the top 10 common blunders made by most new car buyers. F & I office: Business -- or monkey business? - Jeff was interviewed for this article about Finance and Insurance (F & I) at new car dealers. Jeff provided information about scams car dealers use in their F & I office. Jeff also provided information on how a buyer can avoid becoming a victim of these scams. Get New-Car Savvy Online - print edition, page 152. Jeff was interviewed by Better Homes for a story on how savvy consumers are suing the internet to make their car buying hassle-free. The #1 Sales Scam - print edition, page 138. Jeff was interviewed for a story warning consumers of car buying scams. Con victims out $10,000 or more Jeff was interviewed by Bob Sullivan of MSNBC News for a feature story about how Fake escrow sites, and fake car sales are a devastating combination. Internet Scammers "Phishing" For Your Identity. Jeff was interviewed by ABC-10 in Miami for a feature story about scammers who email you with Phishing emails, designed to spoof companies that you have login accounts with, and trick you into entering your sensitive information, credit card numbers, Social Security number, etc. Avoid Internet Rip-Offs. Jeff was interviewed by ABC-10 in Miami for a feature story about fraudulent escrow web sites trolling eBay for victims of eBay fraud. Jeff supplied much of the warranty buying tips during phone interviews which Kiplinger used in their article "Avoid the 7 Deadly Sins of Extended Warranties." Annual Auto Issue, Page 17. 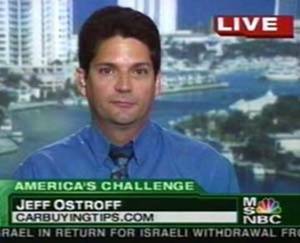 "Tricks Of The Trade" Jeff supplied Consumer Reports with most of the research and content for the scams listed (from our 2002 Top 10 Scams List.) Jeff also supplied them with the victims that were interviewed for their article. Special car buying section, page 27. Also available online at their site. Click Here: "Not All Extended Warranties Are Created Equal." Article has extensive coverage of CarBuyingTips.com. The Print version has screen shots of our extended warranty article.